Recently ramens have been all the rage, from various eateries offering various types of japanese ramen dishes. I had the chance to dine over at Goku Raku Ramen over at Midvalley Megamall the other day, and I must say, it was a rather tasty affair. Lot S025 & Lot S026 , Level 2. Mid Valley Magamall, Kuala Lumpur. Upon reaching the venue, we were welcomed warmly and promptly ushered to our tables for an evening of exciting ramens, and japanese dishes. I found the name Goku Raku Ramen rather amusing, even though I'm not exactly certain what it meant, it does have a nice ring to it. Before we could dig into their signature ramens, we were briefly introduced to the concept, and method of preparation by the two chefs, Ramen connoisseur, Mr. Teruhisa Shimizu, and Mr.Saito San who sat beside him who was the translator for that night. It was really interesting to note some of the soup used for the ramen had to be simmered for up to 36 hours, retaining all those pork essence for our enjoyment. To kick off the night, we were served with these deep fried pork pieces, Buta Katsu as appetizers. Now I truly am in love with this dish, as it was both soft on the inside yet crispy on the outside retaining all its flavours. One bite, and I just had to have seconds. It was just a tad too salty though if taken excessively. Up next was their best signature ramen dish, the Ultimate Ramen. The name itself brought images of being the top ramen dish of Goku Raku. So what makes this dish special? For starters, the soup itself is the Tonkatsu Soup, brewed for up to 36 hours, infused with so much pork essence that one could virtually taste the yumminess in the thick soup. Served with two beautifully done eggs, and some pork meat on the sides, the Ultimate Ramen had to be my favourite ramen dish for the night. The Goku Raku Miso Ramen dish that was served next looked almost similar except for the soup base used. Instead of the tonkatsu soup which was used in the Ultimate Ramen, here we had their Goku Raku soup which was a blend of pork, chicken and a hint of fish. Personally I still loved the Ultimate Ramen for its pure porky delight. Most Japanese ramen meal would not be complete without their signature Gyoza dish, and here at Goku Raku Ramen, it was no different. They serve some rather nice Gyoza, in two types of variant, one with the crispy rice webs on the side, and one without. As we were told, the original gyozas from Japan all had these extended crispy rice webs on the side. We ended the meal with some sweet desserts in the form of Goku Raku's rare Cheese Cake, and their Annin Tofu. The cheese cake had a really strong sourish cheesy taste to it, one which had to get some getting used to. Personally I preferred cheese cakes which are of the sweeter variant. The Annin Tofu was basically an almond pudding, so if you're into almond then go for this. 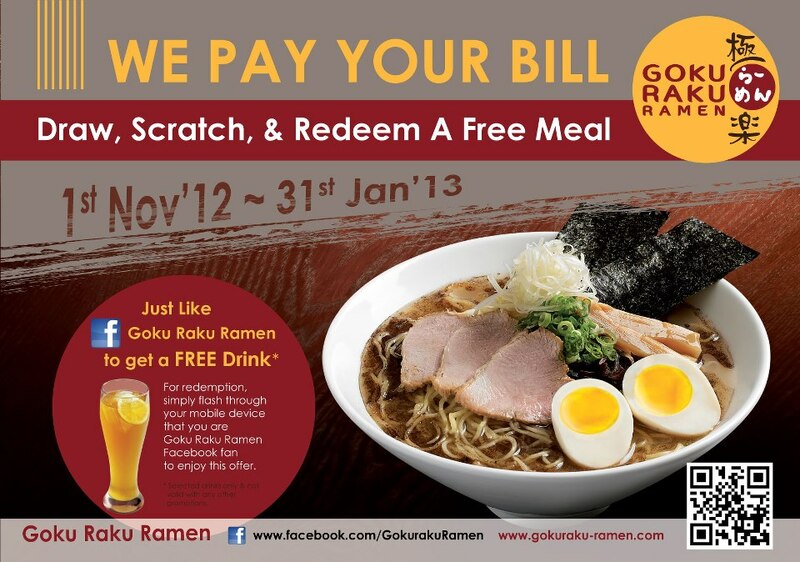 Currently Goku Raku Ramen is running a promotion named ''We Pay Your Bill !''. For a chance to get a free meal from Goku Raku Ramen, all you have to do is to Draw, Scratch , and Redeem A Free Meal! Contest duration : 1st Nov - 21st Jan 2013. 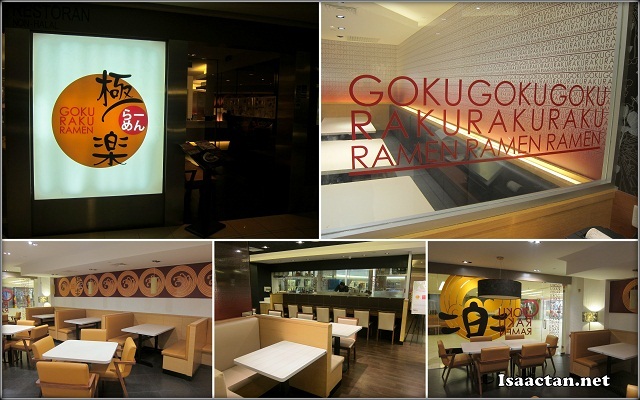 *There is a 20% chance of obtaining that free meal, so do drop by Goku Raku Ramen restaurants soon! Not a fan of Japanese but the stuff here looks good. You take me next time, k? Wink! Wink! Level 2, new shop eh!